Leo and Audrey both have their fair share of problems. Leo is verbally and physically abused by his father, who thinks that is the only way he can help his son become a good man-better than his own father. Audrey’s father is in prison for murder, and she can’t shake the feeling he is innocent. Together, these two broken individuals make themselves whole again, showing everyone who the true fighters are. Both raised in a military family, high expectations and a clean reputation have been placed on their shoulders. Some of my friends (back in ye old’n days) grew up in similar situations and it was nice to see the correlation between fiction and reality did not have a big gap. The best way I can describe STEAMLINE is: a contemporary romance murder mystery with swimming. Emphasis on the contemporary romance. I felt like the book would have been strong enough without the main characters having to go through this puzzle. There was almost too much going on. Drawn first to the novel by its cover, when I found out it was about swimming, I had to read it. I love the water and everything about it. STREAMLINE goes into detail about the sport and competitive swimming and I throughly enjoyed that. I also liked how the dialogue between characters was smooth and realistic, unforced and natural. One thing that might bother some readers, however, is the change of POV. You are taken into the heads of almost every main character in the novel, and this is a really hard feat to pull off. It’s hard enough to master one character-their flaws, dreams, and fears-but five? Definitely have to applaud Lane on that. If you are a huge fan of contemporary, I wouldn’t pass this one up! Swimmers, I also recommend getting your hands on this one! STREAMLINE is story with multiple narrators, but at the base Leo Scott is the main character. Leo is the captain of the swim team, incredibly smart, good looking and has an equally successful and attractive girlfriend, Audrey. Most people would consider his life perfect, but underneath it all he has to deal with his overbearing abusive father, and Mother who was left crippled after a serious car accident. Substance abuse, depression, suicide, infidelity, teen pregnancy, and murder; this book addresses these issues and main others. To be blunt the characters in this novel had many struggles to endure, and I feel if I were in their place I would crumble apart. I find that novels that deal with this many serious issues usually seem over done and cheesy, but Jennifer Lane managed to address these issues in a way that made it seem realistic and not annoying to read. Unlike some novels where there are several narrators, the characters were very complex, and seemed liked individuals; instead of many characters with the same base personality. I think the only real con is that the story moved along a little too fast in the beginning. It seemed like right from the first page there was a lot of issues already, there wasn’t much time to get a feel for the characters before you were thrown into their issues. Which is the reason for the four star rating. 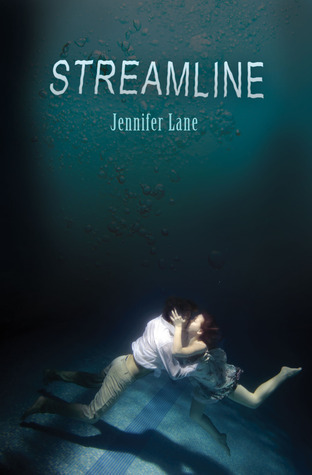 Readers In Wonderland is so excited to have Jennifer Lane, author of STREAMLINE, to talk about the book and her inspirations in writing it! This is one of our first author interviews! Thanks for participating, Jennifer! I read that you were a swimmer in college. Did that heavily inspire you to write STREAMLINE? Do you still have a passion for the water? Did you have to do any research for the novel? On swimming or murder investigations? a commander and a “firstie” (college senior) to learn what it’s like for midshipmen and athletes there. Patrol”, so the research is ongoing. You are also a psychologist, did any of your patients inspire the situations that Audrey and Leo wereplaced in? strengths and normalcy but at times we can put the fun in dysfunction! Did you go into writing STREAMLINE more with the idea of making it about romance or mystery? Thank you for the DOUBLE review, Alise and Brooke! I feel honored. Alise, are you a swimmer? :-) Brooke, I think I’d crumble under all that pressure too. I’m glad to hear you found the characters to be unique and complex. Nice interview! Taking to the authors is always great for a review. Thanks! I agree, and it’s really fun!